Have we got the right picture for this web page? Actually, yes, we have. 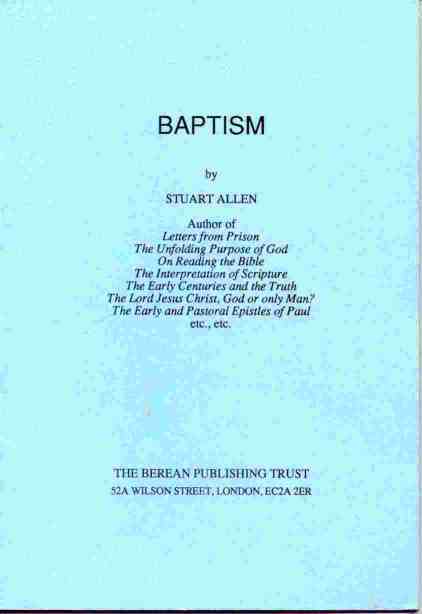 The word ‘baptism’ often conjures up an image of water. However, in the Scriptures, there are several baptisms mentioned, and about half of them have nothing to do with water at all. 1 Corinthians 10:1,2 even speaks of a baptism where it was in a person’s best interest not to get wet. Ephesians 4:5 tells us that, today, there is one baptism, not several, in operation. If someone has put their faith in Christ, they are said to have been “baptized unto/into Christ” (Romans 6:3), or to have “put on Christ” (Galatians 3:27). In general terms, we died with Christ and we are identified with Him; because He is alive, we have been given life too. The list above constitutes the one baptism (Ephesians 4:5) in operation today. This baptism is not a water baptism, but identification with Christ in His death and resurrection. We are reckoned as righteous before God, because we have been identified with Christ’s righteousness. This, indeed, is grace! It can be seen, then, that our privileged position comes with responsibilities, too. So, what does ‘baptism’ actually mean? As a general definition, ‘baptism’ has the idea of being overwhelmed, encompassed, enveloped (as in a fog), clothed, surrounded by something etc. This sense can be applied in some way to all baptisms in the Bible. Immersion in water may be involved, but not all baptisms involve water. In Scripture, we read that some baptisms include: being immersed or washed in water, being endued with the Holy Spirit, being identified with Moses and all he stood for, being identified with Christ in His death and resurrection, and there are others. See our Chart – Various Baptisms Compared , which outlines the features and roles of 10 different baptisms mentioned in the Bible. 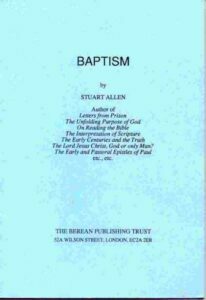 For further reading, view the PDF booklet Baptism by Stuart Allen. It is written in simple language, but covers many facets of what can be a complex subject.